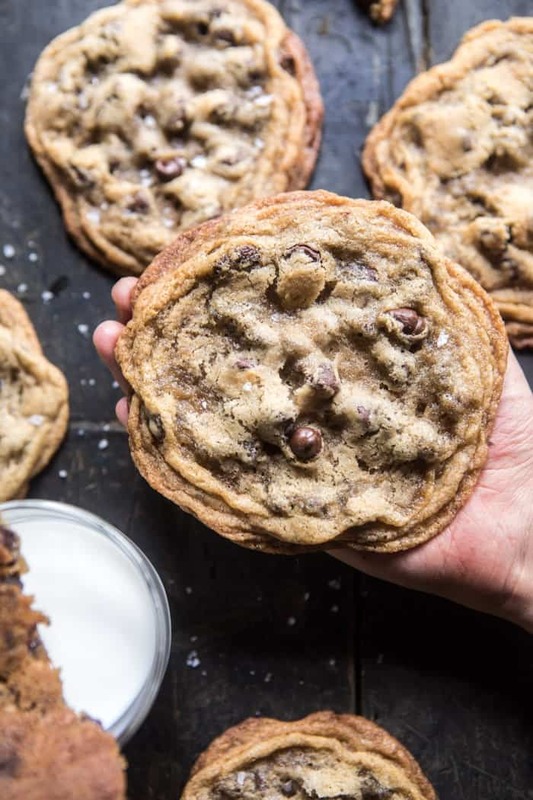 It’s official, this week was unintentionally summer comfort food week, and we’re ending with the best recipe ever…giant chocolate chip cookies. One: nothing will ever beat chocolate chip cookies…unless they are GIANT chocolate chip cookies. Two: I’ve been in serious comfort food mode, which I find so odd considering the time of year, but sometimes life throws you a curve ball, and sometimes that means you just need to make all the comforting foods you can. You know? In all honesty, the last week has been one of the harder ones. I have been keeping my face bright on the outside, but on the inside everything is all wacky. I’ve mentioned this before, but I have always struggled with anxiety, and with the death of my grandma + my general constant stress of work related stuff, I think it’s just been a lot…and is taking me back to my middle school days. I always find talking about it really helpful, so instead of sugar-coating things, I thought I’d just be real. Everyone deals with their own battles and this is totally one of mine. I have found some things that really help though, one of them is just being to talk it out. I’m going to share more tips/tricks that I’ve learned over the years in Sunday’s Nine Favorite Things post, so if this topic is of interest you, stay tuned! I’m headed back to Cleveland tomorrow for my grandma’s funeral, and while I am sad to be going back to my hometown to say a final goodbye to my Nonnie, I’m also excited to meet a new cousin, Seeley (my grandma’s maiden name), who was born yesterday. Seeley is the 17th grandchild for my grandparents. She was born exactly one week after my Nonnie passed, on the 17th day of August in the year 2017. I would say that 17 is Seeley’s number. I am excited to share a new life with my family. And for me, that is these cookies! Fun, happy, and so freaking good. Addictingly good, but then that’s obvious, right? As mentioned above, there’s nothing quite like a homemade chocolate chip cookie. I had many of them growing up. My mom was a serious baker and I know I have said this a million times over, but for you newer readers, mom would have dessert on the table before dinner was even started…or decided on. My friends always wanted to come over to my house for the cookies. I remember my best friend Stephanie and I and literally eating a whole batch one summer afternoon after lacrosse camp (which was a short-lived camp for me…cause I was not a camp goer). And all my guy friends? They definitely came for the cookies. No one made cookies like my mom. No one. Anyway, as you have probably gathered, cookies are a thing at my house and always will be. Oddly, I have yet to share my mom’s perfect chocolate chip cookie recipe (should I? It’s kind of simple…), but today’s recipe is pretty similar, just a lot larger in size! With back to school time here, I always think about chocolate chip cookies. I always loved when I would come home from school to a fresh batch of mom’s cookies, especially if it was a Friday. So today we are celebrating Friday with chocolate chip cookies! But guys, these are not just any chocolate chip cookies. 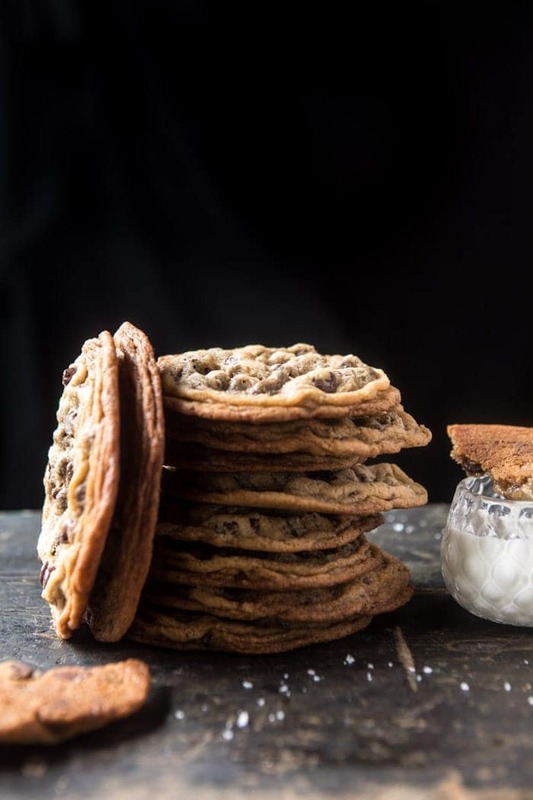 Nope, these are giant chocolate chip cookies and they are just as glories as you’d expect. 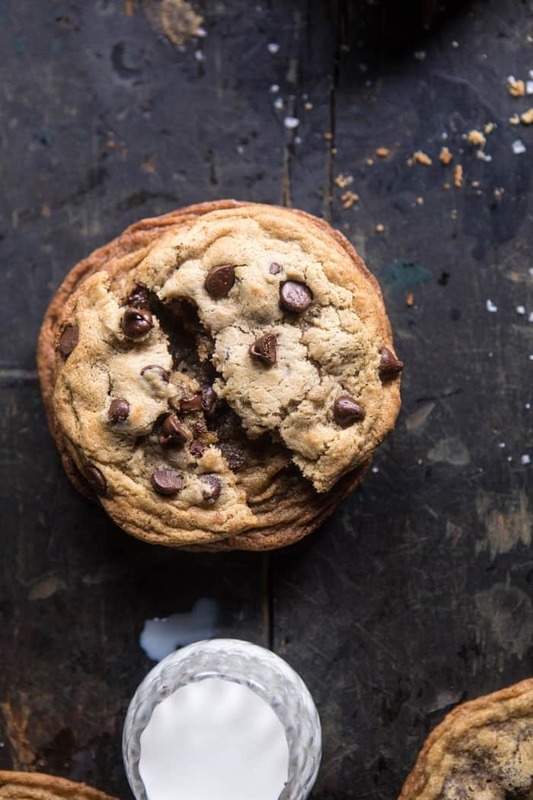 Think of a chocolate chip cookie, but then double or even triple it in size. Ahhhh…enter all the heart emojis now. Why have a small cookie when you can have a GIANT cookie?! Crisp on the outside and chewy in the center. The edges of the cookies turn slightly crisp (only slightly, so it’s good!!) while the centers are doughy, chewy, and basically just all things perfection. And you know what else? This cookie recipe requires zero chilling. 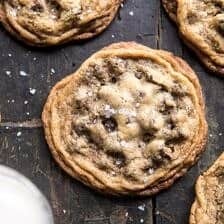 Meaning you can get up from your desk, couch, bed, or wherever you’re reading this (wordy) post from, bake up some fresh cookies and have them ready in just about twenty-five minutes. My guess is that if you are a baker, or even just a lover of chocolate and butter, you’ll have all the ingredients on hand right now. 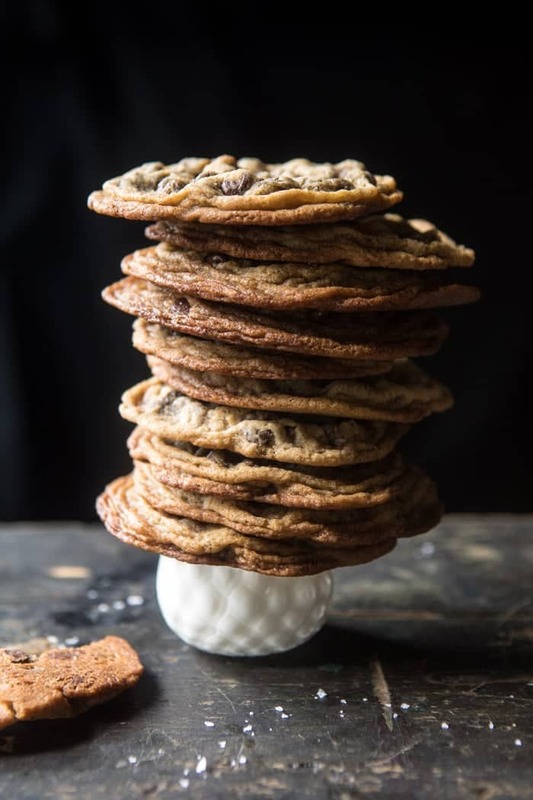 Okay, after all this chatting, have I convinced you that your Friday night plans should include making these giant chocolate chip cookies? You know that mine do, alongside a cold glass of milk. Then maybe some dinner…because sometimes that’s just how we need to roll. A small chocolate chip cookie just isn't enough! 1. Preheat the oven to 350 degrees F. Line a baking sheet with parchment. 2. In a large mixing bowl, beat together the butter, brown sugar and sugar until combined. Add the eggs and vanilla, beat until combined and creamy. Add the flour, and baking soda, beat until combined. Stir in the the chocolate chips. 2. 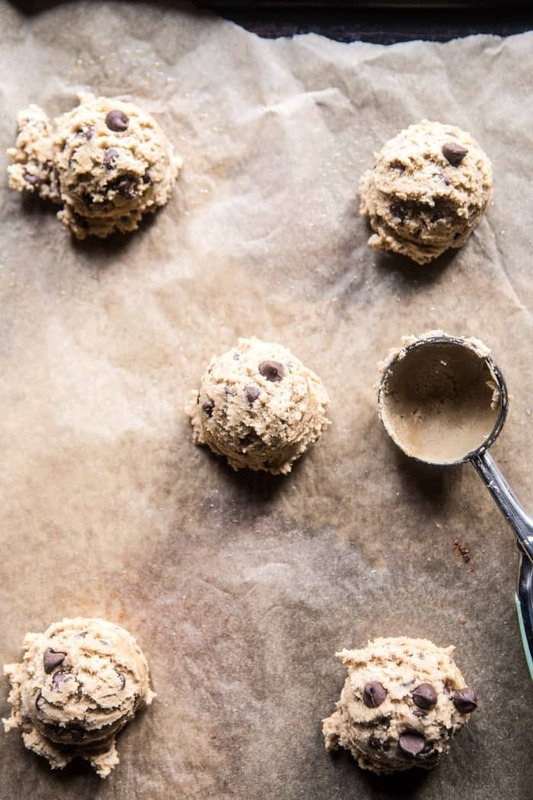 Using an ice cream scoop (this makes things really easy) or 1/4 cup measure, roll the dough into balls and place 3 inches apart on the prepared baking sheet (about 5 per pan). Gently push down to flatten the balls just slightly. 4. Transfer to the oven and bake for 12-15 minutes or until the cookies just beginning to set on the edges, but still doughy in the center. Remove from the oven and let the cookies cool 5 minutes on the baking sheet. They will continue to cook slightly as they sit on the baking sheet. Eat warm (highly recommended) or let cool and store in an airtight container for up to 4 days. *If your cookies are puffy when the come out of the oven, tap the baking sheet on the counter 2 times to flatten them down. Friday + cookies = a very happy, smiling Tieghan. Have a great weekend everyone! 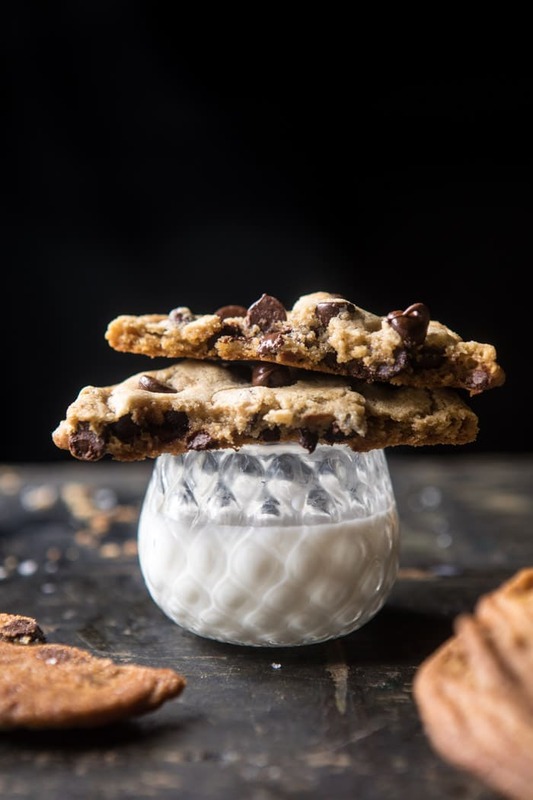 Browned Butter Coconut Chocolate Chip Cookies. 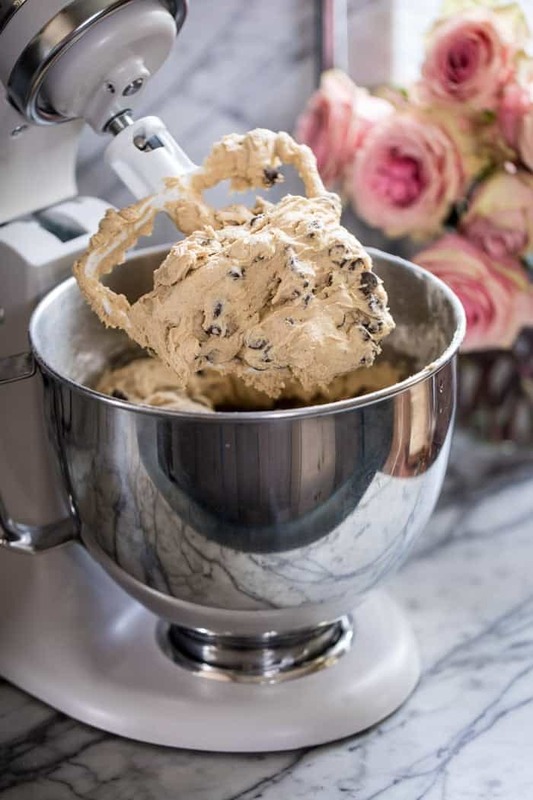 Thank you for sharing this scrumptious chocolate chip cookie recipe. Sending you lot of positivity vibes. Safe travels back here to Cleveland. Thanks so much Liz, really happy you like the cookies! Hope you love them! Thanks! I noticed that the flour is missing from the ingredient list. How much flour do you call for in this recipe? SO sorry about that it is added now! Its 2 1/2 cups all-purpose flour!! I like the fact that you are honest! Comfort food is wonderful. I hope you have a good funeral, which helps to say goodbye. Will pin these cookies, they look great! Comfort food is just everything at times like these! Hope you like the cookies Jenny, thanks! How much flour should we be using?! 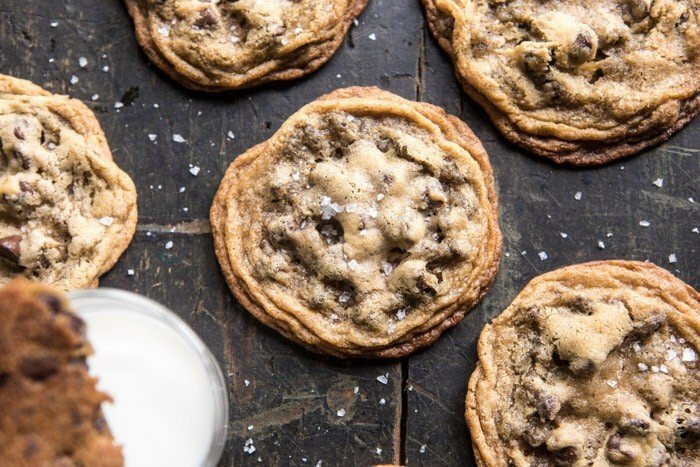 These look incredible…I’m a sucker for chocolate chip cookies. They’re perfect any day and any time of day too! I might have missed something, but I can’t see the amount of flour for this recipe. Would love to try them! I can’t see the flour listed in the ingredients, only in the directions??? Thank you so much. You are so strong. I know that I couldn’t keep up a blog with everything that is happening. You can get through anything, and there is literally nothing a good cookie can’t fix. Well done, and remember that we are all here for you. Its been tough but its my passion so I try my best to keep it running through hard times! Waldo must have the flour with him? How did you know I needed cookies today! OMG the crispy edges look so good – I might have to make these and sandwich some ice cream inside this weekend! <3 Celebrate Nonnie and have a wonderful time in Ohio – I'm so sorry that you lost her. YES! Ice cream makes them even better! Thank you and by the way my weekend with family was wonderful! I am going to make these and think of you and your Nonnie. Did you forget the flour with all that is going on? Look awesome. I think you left out the flour amount. Just double checking – there’s no flour in these cookies? Did I miss the flour? No I forgot! SO sorry about that it is added now! Its 2 1/2 cups all-purpose flour!! These look incredible! I will definitely be making a batch of these to take to work! Id take the post down until the flour omission is corrected. Love these cookies! How much flour do you need? Thanks fro sharing! Thank you! SO sorry about that it is added now! Its 2 1/2 cups all-purpose flour!! I haven’t tried the cookie recipe yet but my son is coming home from university next week so I definitely will then. Regarding your comments about Friday, I agree with you 100%! I hated high school and LOVED Friday afternoons and still do, it’s my favourite day. There’s no flour amount listed in the recipe ingredients. Can you please add? Thx! I really want to make these but you forgot the flour amount in the recipe!!!!! They look yummy, I would love to make these! I do not see flour in the ingredients. How much flour and what kind. SO sorry about that it is added now! Its 2 1/2 cups all-purpose flour! Baking was not in the plans for my Friday night, but I think I may have to change my plans after reading this post. These cookies look amazing! And totally agree about Fridays. As an adult, they are still the best! Take care and safe travels Tieghan. Awh yay sounds like a fun Friday to me, hope it was amazing! They look bloody amazing!! I just realised that I’ve never made chocolate chip cookies before… I’m the worst food blogger in the world! Need to rectify that asap! Oh my gosh, I love them so I have done many!! Haha! Hope you have fun making your recipe!! Thinking of you Tieghan–take care of yourself this weekend! Hope it helps your healing a little bit. These cookies seem like the perfect way to celebrate your Nonnie. Thank you so much Erica! It was a nice weekend! So sorry for your loss Tieghan. Safe travels back to Cleveland. Nothing helps a sad soul more than a warm chocolate chip cookie. Your right about the cookies! Thanks Maggie it was a nice trip with family. Hey girl! 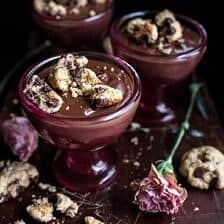 Have you done any experimenting in the past to make these GF? I’m so sad I can’t have gluten any longer and the thing I’ve missed the most has been cookies. Just thought I’d ask on a whim! Also, have you ever tried baking with Cassava flour or tapioca? If so, what are your thoughts? Xoxo! Okay so I need five of these in my belly NOW! Your creativity always amazes me, Tieghan. Made them asap. But they turned out really tall and fluffy. What did I do wrong?!? Hi Alison! I have found that over baking turns the cookies puffy. I like to remove my cookies just as they are beginning to set around the edges, but are still a little doughy in the center. They continue to cook on the pan. Hope this helps! Hi I fixed this theres is 2 and 1/2 cups four. sorry about that. h wow just answered your comment!! Sounds like you know your cookies, so happy you liked them!! Thanks Karen! So sorry for you loss. I made these cookies and they turned out really fluffy? Don’t know what I did wrong.. Thank you, Maya. I have found that over baking turns the cookies puffy. I like to remove my cookies just as they are beginning to set around the edges, but are still a little doughy in the center. They continue to cook on the pan. You can also gently push down on the cookies before baking to help them flatten better. Hope this helps! Hi Tieghan, I’m so sorry to hear about your grandmother. I feel your pain because I’m the same way and I got through the same struggles. Keep mind busy with things that you love to do. It helps to put my mind into cooking and I am sure that helps you as well. Thank you so much Carlos! Perfect way to celebrate a Friday Tieghan! I’m so sorry about your grandmother. I’m sure it’s comforting for your entire family that she’s no longer in pain and in a better place…where one day you’ll all be together again…eating cookies. Sending hugs your way. Thank you MAry Ann, it means so much to me that you said that! I am glad she is not suffering anymore as well! SORRY! I hadn’t refreshed my screen. ..had opened this recipe earlier and didn’t see the updates. My cookies don’t seem to have the lovely ripples of dough at the edges as yours after cooking. Any ideas on what I am doing wrong? I like to remove my cookies just as they are beginning to set around the edges, but are still a little doughy in the center. They continue to cook on the pan. You can also gently push down on the cookies before baking to help them flatten better. Hope this helps! 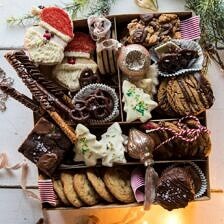 These cookies look wonderful!! I know how you’re feeling… I also deal with anxiety (for my entire life actually), and I understand grief. Hang in there… I think channeling your energy into your passion (cooking) is one of the best ways to cope… that’s what I do, anyway! My cookies came out tall and fluffy too 🙁I swear I followed the recipe to a the T.
HI Trisha! I have found that over baking turns the cookies puffy. I like to remove my cookies just as they are beginning to set around the edges, but are still a little doughy in the center. They continue to cook on the pan. You can also gently push down on the cookies before baking to help them flatten better. Hope this helps! Do I add the flaky salt before or after baking? If its after is it while they are still warm? I hope you’re feeling better now, Tieghan. It takes a lot of work to put out all the content you do but always know that it’s appreciated by people like me, your fans. I am glad you enjoy the content I put out there, it is truly to engage with you guys! Thanks Lori! I made these too (with flour) and so did my best friend! They came out fluffy and puffy and we followed the recipe exactly! Please double check your ingredient/recipe list and update us! Hi! The ingredients are all correct. I have found that over baking turns the cookies puffy. I like to remove my cookies just as they are beginning to set around the edges, but are still a little doughy in the center. They continue to cook on the pan. Hope this helps! These cookies look amazing and I will definitely be making them next week for when the kids come home from school. So sorry for what you and your family are going through. On a totally off topic note – where did you get those glasses?? I want them and would love to see them filled with milk on my dinner table!! Thank you so much, Kim! I bought the glasses from the below store. I love them! First, these look amazing! And second, I’m right there with you dealing with my own anxiety and constant work stress. I find that one thing that helps me is knowing I’m not alone – although I’d never wish anxiety on even my biggest enemy! I think it helps to feel a little less alone/not crazy. Anyway, I wish you the best and can’t wait to try these cookies! I am the same way. It’s always helpful knowing I am not along! I would NEVER wish anxiety on anyone either. It’s awful! Glad to say I am feeling better! Hang in there and thanks for the kind words! My problem with bigger cookies is keeping them from falling apart. Any trouble with these? Hey Danie, I did not have any trouble with that. Hope you love the cookies! These look amazing! Going to make them for company coming to visit this week. So sorry for the loss of your grandmother! I hope everyone loves them, thanks Amy! Made these for my friend’s neighbor who was kind enough to share his eclipse glasses with us yesterday! He loved them. I loved them. My friend loved them. Her husband loved them and their kids loved them. Huge hit even if mine turned out fluffier and puffier (which auto corrected to pudgier 😂). 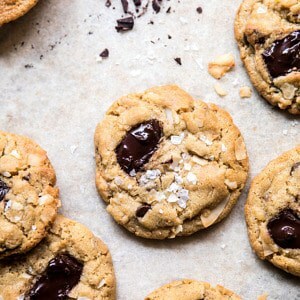 I love the addition of the salt on top of the cookies. Chocolate chip is my favorite and these definitely hit the spot for my comfort food needs during my last month of board prep. Thanks Tieghan! Yay! I am so happy these were a hit all around! Thank you so much Anastasia! Tieghan, I’m so sorry for your loss. I only have one grandmother alive now so I know how you feel. It’s tough :-(. We’ve also been dealing with lot of stress lately because we are searching for childcare for my son, we just moved to a new house that has plumbing issues, and my husband started a new job and is working 12 hour days. I think these cookies will make us feel better :-). Plus, chocolate chip is my favorite! Enjoy meeting your baby cousin while she is a newborn. They get so big so fast! I’m sure her parents (is one of your brothers her dad?) would appreciate any freezer meals you could make them. Just realized….this is YOUR cousin…so she can’t be your brother’s child. It’s too late in the day for my brain to work well. Thank you so much Amber! Sounds pretty stressful with all the changes happening around you, so I really do hope these cookies help haha! I hope you have a great rest of the week! So sorry for your loss Tieghan… Tough times.. Thanks for taking the time to share that recipe anyway. You’re a true rockstar. Thank you for the sweet words Maëva, it really means a lot! When do I add the salt? Before or after baking? And what if they are more cakey than yours?? Hey Anna, I like to add the salt just after the cookies come out of the oven. They should not be cakey, but if they are I am sure they will still be delicious! I am so sorry about your grandma. Grandmas are truly the best! Sending you well wishes too! My cookies turned out puffy! They look great but what did I do wrong? The only thing I can think of is I added the baking soda with warm water. Could this have caused them to be puffy? Hi Teresa, I have found that over baking turns the cookies puffy. I like to remove my cookies just as they are beginning to set around the edges, but are still a little doughy in the center. They continue to cook on the pan. You can also gently push down on the cookies before baking to help them flatten better. Hope this helps! Haha! This could be an awesome video actually! Maybe I will make it!! Thanks Cassandra! I wonder if these are freezer friendly? They freeze great! Let me know if you have questions. Enjoy the cookies! Yes Hope, these freeze really well! These cookies are amazing & huge!!! Love it. I will try to flatten mine more before baking to get to look more like your photos. Does elevation have to do something with the baking…rise vs, flatter & crisper cookie? Cause your up high in the mountains, I’m closer to sea level? Either way me & the kids loved it! Will make again. & now that you just said can freeze them…Oh Yeah!!!! …oh, & yes! you should share your mom’s perfect chocolate chip cookie recipe too! These cookies don’t turn out at all as pictured in the photos, which (given the rippled edges) look like they were made using the NYT “crinkled” cookie dropping/slamming technique during bake… The batter is fine tasting but these make a very bready and lofty cookie–if being a mile-high is part of the recipe, the author would be kind to add adjustments for average altitude or at least a note!. Hi Lynn, I am sorry you had trouble with these cookies. It is very hard to know what went wrong without knowing how you baked the cookies. I have found that of you leave the cookies in the oven a little too long they turn cakey. Again, sorry for the trouble. Let me know if I can answer any other questions. Thanks! Made these cookies last night. Yes there was extra work with process. But I enjoyed the banging part. I got pretty large crinkly cookies. Thin and crispy on edges and chewy on inside. Yum! I am really glad you enjoyed these Danielle! Thank you Alex! I am so happy these turned out great for you! I’ve always love your recipes, but was super disappointed with these cookies. Instead of the chewy inside I was expecting (as the pictures showed) they were totally cakey – and I followed the recipe exactly. Perhaps it was something on my end, perhaps not. Thank you anyhow! Have a wonderful week! Hi Brenna! I am so sorry these did not turn out well for you. Could I help you figure out what went wrong? Please let me know! Thank you! Hi Emily! These recipes should work great at high altitude as well! I hope you love these! I was worried after reading some of the comments, but I rolled with it anyways. I ended up baking mine for closer to 16 minutes (which is CRAZY!) and they still came out looking very light colored. I was pretty sure I wasn’t going to like them. Upon first bite I discovered they were the best cookies I’ve EVER made. Freakin crazy good. 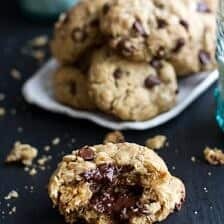 Everything you want in a chocolate chip cookie- crunchy on the outside, perfectly moist and chewy in the middle, not too sweet, not too buttery… just perfect. I’m not sure what happened with those who had their cookies come out “cakey”, but I did make a second batch of smaller sized cookies (since the recipe is specifically for extra large ones) and the small ones did not come out as well. I think these are just made to be extra large, and they are simply perfect that way. 10/10, these will now be my go-to chocolate chip cookies. Wow! I am so happy to hear that Rachel! And I am so glad these turned out amazing for you! Thank you! 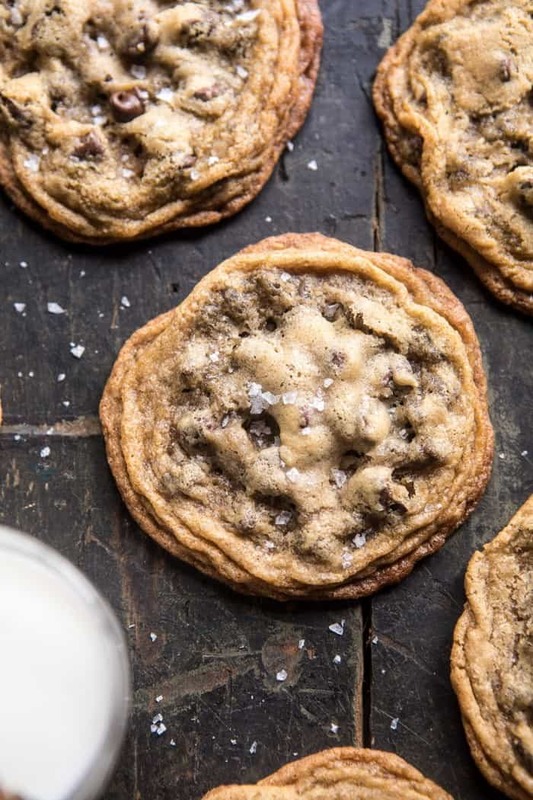 These are AMAZING and the best chocolate chip cookies I have every made – no contest. My husband and son agree! Thanks for the recipe! We were so excited about these cookies and my daughters and I made them today. They were caked and fluffy and it wasn’t from over cooking. I checked them at 8 minutes and they were already puffed up! I tried flattening them before putting in the oven and slamming down the pan- still fluffy and Camry! Any ideas? Hi Hallie! I am so sorry you are having trouble with these cookies. Did you change anything about the recipe? Any info you can give me would be helpful in problem solving. Hope I can help! First time I followed the recipe exactly baked for only 10 minutes puffy & cakey- made them again the next day and used a little less than 2 cups of flour and they came out much flatter! Still didn’t get super crispy- but they where delicious! Maybe I’ll tey again with less and bake more longer? Not sure what else to try! Not bad cookies – Cookies did not come out like the picture – the picture looks like the NYT pan banging cookies (which are amazing) but these did not. And baked up a lot quicker than the 12-15 min. These were done more around 9 min. Ooh! Would love to try this! Since it’s a baking recipe, any chance you can include the measurements in weight? Baking from Europe and I noticed that American recipes don’t always translate well when I do measure by cups. The flour & sugar here are a bit different. Thanks! Can I chill the dough in the fridge before baking it?